For Chinese immigrants, learning English is one of the biggest challenges that they face. Without English they can’t speak to a clerk in a store, are limited in the kinds of jobs they can get, struggle to get a driver’s license, are unable to talk to their child’s teacher and much, much more. The Adult ESL program offers classes that help new immigrants learn to speak English so that they can function at their workplace and in the community. 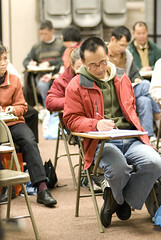 Each year, about 1300 adults attend our weekday morning and evening ESL classes and citizenship preparation classes. The program also offered computer-assisted ESL classes using a free website called English for All. Each class term, we usually offer 30 classes which meet four days a week. Due to the diligence of our students and the good work of our teachers, about 40% of our students improve at least one federal ESL level each year. This greatly surpasses the state’s benchmarks for learning gains. Our ESL and citizenship classes are supported by federal and state funds through Illinois Community College Board. For more information about the ESL Program please contact Walt Schoenfuhs at walterschoenfuhs@puitak.org or at (312)328-1188 x203.